Quick update on the contest: Looks like two entries so far, and interest from a couple others. Com'on guys (and girls) - have some fun!!!! I may have made the rules a little strict, so let me loosen then a bit. Maybe I was the only one of this ragtag group of dorks that played a lot of baseball as a kid. And I mean a LOT. I played the hell out of the sport from age 6 until my final year or organized ball at 15. That was the first year I rode the bench for most of the season (age, I guess). And the game looked boring while soccer looked exciting. So there are plenty of pictures with me in uniform. Maybe I am just lucky. Maybe you all played as much but don't have access to images. So here's an idea: how about a baseball card baby announcement of yourself like Sooz and Dan did? Try and use a design that's the year from your birth. Commishbob, I know that would probably be a T206, but go with it. If you are interested in taking part, leave a comment on that post and I'll wait until you post your design. Ok - how about a single card? Topps did an online exclusive all blue sapphire Chrome set. The full series 1 and 2 sets. 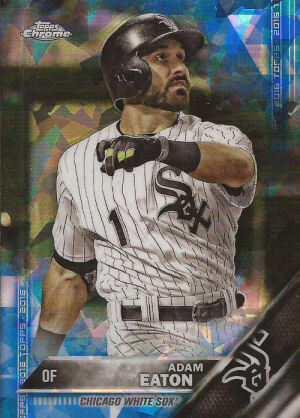 That's how I have a Chrome Eaton from 2016, as he & most of the Sox got kicked from the hobby/retail Chrome set. For $5.75 total with shipping, I could have bought a pack of Chrome and not pulled ANY Eaton cards, so this is a win in my book. And the scan does these cards zero justice. These are gorgeous in hand. GO ENTER MY CONTEST! WIN CARDS! DO IT! I'd do it, but I lack any and all know how. For starters I'd you the 66 Topps Design (in fact there is a John Miller in that set, so all I would need to do would be somehow put one of my lame pics in where his is. But, no idea how to do it.